Hi. 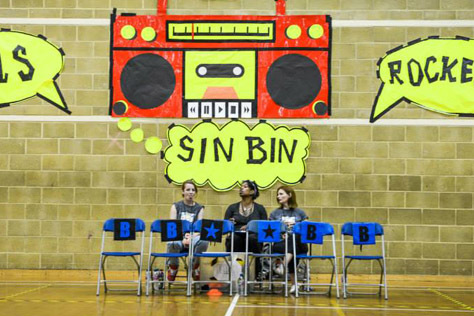 My name’s Brian and I’m a roller derby penalty box. People sometimes don’t appreciate how much of an important role I can play in the outcome of bouts I’m involved in. That’s why people rarely ask for my view on a game. How many times have you seen a vlogger or announcer interviewing the penalty box (the box itself, that is, not people in it) during or after a derby bout? Never, I bet. It’s not like that in other sports, of course. Karen, a tennis net I used to go out with, is barely off the telly in Wimbledon fortnight, arguing with John McEnroe in the studio on the majority of highlights shows. And don’t get me started about Julian Johnson, that football goalmouth who thinks he’s the bee’s knees ever since the Mail on Sunday gave him a weekly column, gadnammit. 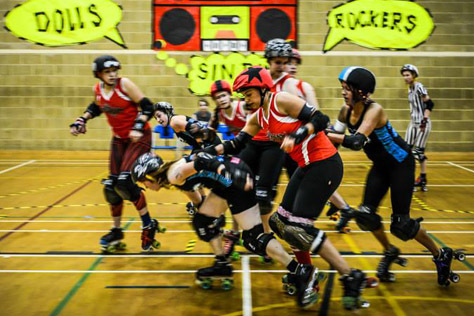 So I’m sure you can understand how delighted I was when unofficial Brighton Rockers fans’ group BRATS asked me to cover Pump Up The Jam, the Sussex league’s hip hop themed home bout against the Leeds Roller Dolls Rebel Roses. Of course, it’s going to be tricky. I don’t want any of the players to know I’m covering the bout, so I’ll have to quickly hide my notes, blu-tacking them to the back of one of my chairs, when someone comes skating over to serve out their minute. Anyway, here’s my report. I hope you like it, and I hope that if you run a roller derby blog or magazine of your own you’ll give someone like myself, Salim (a pivot line in Scotland) or Camille (a Belgian turn one apex) a chance to write for you in future. I’m bored. I really didn’t expect to be this bored. Thing is, it’s been four jams now and no-one’s come to visit me. I have these six seats here, all dusted down and ready, and none of the players – from either team – have dropped by yet. Yeah, I’ve got a trio of NSOs sitting behind, but to be honest they’re not the liveliest of company. So darned serious most of the time. Plus having them back there makes me a bit nervous, like they’re going to look over my shoulder (rhetorically speaking of course, us penalty boxes don’t have shoulders, that would be ridiculous) when I’m scrawling notes for the bout report. These opening jams have all been pretty short to be honest, a zero-zero opener followed by a trio of single pass 3 or 4-pointers. Leeds 6-3 up in a very closely matched start. Oh yay! A visitor! Bruise ‘Em Banshee in the Leeds star takes a seat. I like it when the jammers come to visit, especially when they both arrive in quick succession, swapping over in the box for a few seconds chair time each. It gives a real sense of excitement to things, knowing that I – the penalty box – am the centre of attention at such times. No sign of a Brighton jammer taking a pew alongside Banshee any time soon, though. A battling pass through the burly Yorkshire pack and Racey Slamhard calls it. Kapow next up in the star for Brighton; one of the nippiest jammers in their rotation, toughening up with every bout, but finding it heavy going against a solid Leeds defence. 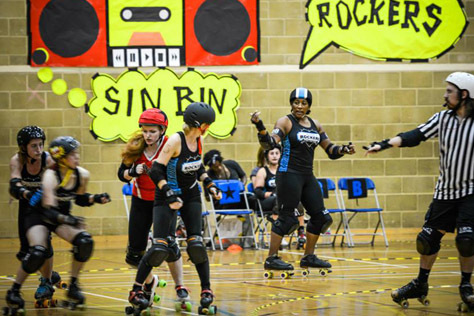 The seventh jam is a biggie for Brighton as another lady in red (Livid Doll) occupies one of my starred seats and Rose Bleed power jams some daylight between the sides, 28-6. Hairy Fairy lines up to jam next. Brighton using a large rotation here, but of the six to take the star across the opening dozen jams, not one has the decency to pop by and visit me. Since when did Brighton turn so penalty shy? I’m confused. For the remainder of the first period, Leeds rarely have their jammer on track for both the start and end of any jam. A rousing series of jumping passes from Bash in the tenth has given Brighton a somewhat surprising 57-7 cushion. Perceived wisdom going into this bout was that Leeds would take the win by anywhere from a dozen to 60 points, but it doesn’t look to be panning out that way at present. The lack of penalties for the Sussex side is surely a big factor in that. Remarkably, unless I missed one while I was scrawling my notes or surreptitiously tying my NSOs’ shoelaces together, it’s not until Jam 13 that someone from Brighton drops by. Whilst the fact it took so long to happen is a surprise, the identity of the miscreant isn’t. Shambolic usually spends half the bout in my chairs, or so it sometimes seems. She’s not wearing the star this time so the effect on Brighton’s points tally won’t be so great. In fact, her star-clad outings will be kept to a bare minimum today. A couple of my chairs get chatting to some of the home bench chairs at half time. 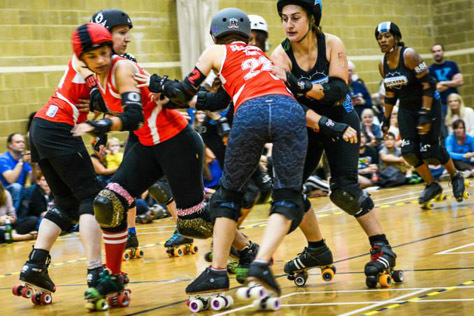 They reckon Sham was carrying a slight knock going into the bout, hence limited star time, but any knock doesn’t prevent her from popping up all over the track as a commanding pivot and blocker. Out on track, Chariot Sophia runs good interference on the Leeds defence as Rose chalks up another hefty haul of points. Super tough blocker Charisse Chapman gets a rare turn in the star for the Yorkshire outfit, with the likes of Livid Doll, Magic 8-Brawl, Feral Fairy, Banshee and a very pacy R.I.Punzel heading up the Leeds rotation. Bash puts up a towering last line of defence performance in many of these jams, as the frustration of getting constantly felled and recycled translates into various Rebel Roses paying me a visit. Leeds have finally starting getting lead status more regularly, but sprightly Rockers starheads like Racey and Sophia are catching them and forcing the call before they can do much damage. Brighton starting to pick up a few more penalties now, and a visit from Bash plays part in a mini-revival as the last few first period jams see the Rebel Roses pull it back from a 93-19 deficit to 100-33. I’m hoping to be busier in the second half, and a cutting call against Sham in Jam 2 sees my first star pantied guest from Brighton. Lead jammer call offs in quick succession see her sit out most of the next three jams as Leeds pull it back to 104-50. Feistier play from the Yorkshirewomen now – they’re chipping away at Brighton’s differential, but will there be enough time to overturn the first period deficit? 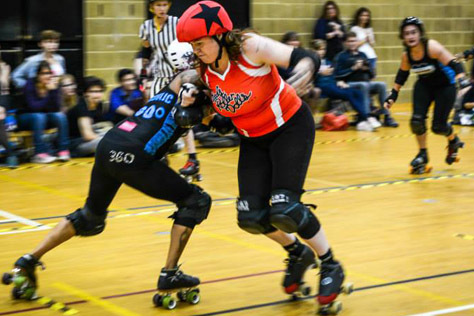 Hairy Fairy drops by to say hi in Jam 6, a star atop her helmet, and Brighton are now suffering from the Rebel Roses’ first half affliction of rarely starting and finishing a jam with their jammer on track. She’s with me again after a few seconds back in action as a very physical Leeds wall start drawing Brighton players towards more penalty risky play. Livid Doll and Fuzzin’ Boots are proving particularly tricky to get past. Business is much better for me this half, and the majority of it’s coming from the Sussex league now. 107-69. 107-78. Nearly twenty minutes left on the clock and Leeds know the way those numbers are stacking up, they have a good chance of turning this result around. Jam 9 and my chairs are empty. Boo, I want the company. Sophia single pass and call. Track cut brings Kapow my way, but Bash is sending R.I.Punzel to the floor again and again as Brighton repeatedly recycle her like the city’s Green-led council are watching. Leeds power jam comes to nothing, team timeout Rockers, Mother Trucker holding Banshee back solidly and legally as Kapow takes lead, Brighton have taken ten points in the past three jams, Leeds none. Gap widening but Sophia’s in one of my star seats now and the Rebel Roses have split the pack, Emma the Condemner held back as Leeds take control, Banshee juking them into triple figures. Jam 14 and I’m all empty again. Sad face. Lead to R.I.P. but Bash is suddenly on her shoulder, forcing the call. Feral making more appearances in the star for Leeds now, a lot of very physical Team England on Team England action between her and Bash, gap down to 121-107. Mass Janeycide calls Brighton’s last team timeout. Announcer El Toupée struggles to hide his Leeds bias as his bassy tones reverberate around the hall. Bash and Feral in the star, pivot line start, Sham expertly edging Feral off track as Bash chalks up a couple of passes. That was an important jam, the clock ticking down on the Rebel Roses’ chances now. Leeds pack on the pivot line, Brighton on the jammer line, Sophia takes lead, could put some distance on the scoreline, but a few seconds later she’s sat in one of my seats. Banshee’s being well hustled and bustled by the Rockers pack, but’s Racey off now – ouch! Coming in too fast, she crashes right into me, sending a couple of my chairs flying. Grrr. Last time something like that happened to me, the perpetrator (London Rockin’ Roller Jack Attack) got expelled from the game, but this time the authorities let it pass. Jam ends with Brighton leading 142-127, about five minutes left, this one could be going to the wire. Rose off next jam, the chance Leeds were looking for, but R.I.P. gets punted too, the duo swapping over in my star seats as Brighton edge it up. 151-130. Jam 21 and I’m empty again. It might be quiet here, but it’s all happening out on track. Sophia v Banshee, 160-134, team timeout Leeds with scant seconds left on the clock, Sophia back in to jam again. Feral takes lead for Leeds, but the Rockers pack are double tough and Sophia is flying around. Feral can’t call it or the game will end, has to hope and pray the Brighton jammer pays me a visit and she can take advantage of the power jam, but it’s not happening. 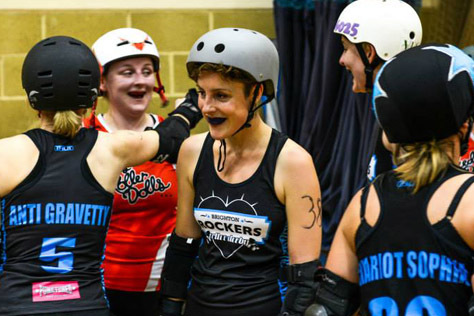 Final whistle: Brighton Rockers 176 – Leeds Roller Dolls 142. Maybe it took them a few months to come to terms with the aftermath of Glasgow, get their morale back, develop new tactics, blood some rookies, etc; but today, with an under-strength squad­ (minus honeymooners and the recently injured) the Rockers were 93-19 up after 16 jams against the higher ranked A-team of a full WFTDA member league who have been in existence for twice as long as Brighton. Just as impressively, when Leeds dug in and fought back so well and so hard – when the Rebel Roses started turning the tide and seemed to have the momentum behind them – Brighton held firm, held strong, held on. Next up for the Sussex warriors is a tough away trip to face Auld Reekie, the UK’s second best league, followed by the showdown with Central City many expected to see at May’s UKRDA Southern Tournament. Two bouts that seem less intimidating a proposition than they might have done before today. Because if the Rockers can continue to play as solidly and as penalty light, with all the resilience, teamwork and tactical nous they displayed today, then there’s not a team in Europe (well, except Brawling, obvs) that they can’t beat. But what do I know? I’m just a penalty box called Brian. This entry was tagged Brighton Rockers, Leeds Roller Dolls, roller derby, rollerskating, sport, UKRDA, women's sport.